85’ x 45’ playing surfaces. This unique facility allows mite players the opportunity to play with the feeling of a full sheet at half the size. 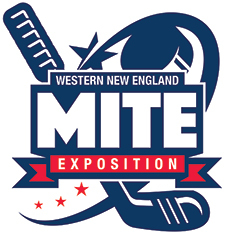 The Mite Exposition will feature 4v4 mite hockey with a goalie utilizing USA hockey rules. performing teams moving onto playoff rounds. This is more than a hockey tournament! MGM Springfield Casino. If that's not enough, Six Flags New England is minutes away. Western New England Mite Exposition.